I spend a lot of time on Facebook and Hootsuite; basically, I am logged on for my entire work day and when I get home, check out Facebook and Twitter for myself and our clients for about 2 hours before bed. Because I am watching the social streams constantly move, I tend to notice trends on postings by people and brand pages. A recent study suggests, regardless of your brand’s page audience, there are better times to post than others. 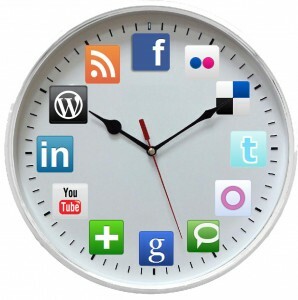 The study goes on to say that certain things posted at certain times will get more interaction based on the sheer numbers of people on each social platform throughout the day. The study, from RadiumOne suggests there are two peak times to post – 10 a.m. through noon and 8 p.m. through 10 p.m. But, it breaks it down even farther dependent on if you are looking for clicks, looking for shares, looking for comments, etc. Remember, your brand page gets seen more often in the newsfeed if you are engaging your fans. The study goes on to say there are best times to post on each platform – Twitter is 1 p.m., Facebook is 5 P.M., Pinterest is 11 P.M. and Google+ is 10 a.m.
With all that info, I am going to partially disagree with the study of 10,000 social users. Remember, I am watching the Facebook Newsfeed constantly as well as more than a dozen Twitter and Google+ feeds. What I have noticed is that, at least for Facebook, you need to know who your audience is. All those page likes don’t mean anything if you don’t know why those people “liked” your page to begin with (unless of course you bought likes…then you really don’t care). You actually need to look at your likes, see who the people are, guess their ages, put them into groups and build a strategy for posting certain things at certain times of day based on the characteristics of those fans. While the study suggests posting something to Facebook at 5PM, I have noticed for several clients that more than half their fans interact in the morning than in the evening. Some pages have zero activity after 7 p.m. When it comes to Twitter and Google+, I have noticed more activity in the morning with Google+. Twitter is a constant flow and pinpointing times for mass exposure can be done with several high cost products out there. I am unsure of the need for that just yet. I like to view my social campaigns this way – being social isn’t about setting a time to talk…it is about engaging whenever you can…sometimes just once a day, sometimes several.